Carol Singing Festival 2013 (聖誕頌歌節 2013) Non-stop Rotary Performance 扶輪頌歌 唱不停大匯演 to support Child Development Matching Fund (CDMF) on Sunday, 15th December, 2013 from 11 a.m. to 6 p.m. at the Shopping Mall of East Point City (東港城), Tseung Kwan O Town Centre was successfully held. District Governor Eugene Fong graced our occasion with Guests of Honour Mr. Paul Chan, MH, JP Secretary for Development Bureau of HKSAR and Mr. Jimmy Ma, JP, Legal Adviser of Legislative Council Secretariat, PDG Tony Wong as well as Ms Vena Cheng, daughter of PDG Moses Cheng who came on behalf of her father, Mrs Amy Chan, Dr. Anthony Yeung and Mr Tony Pang of CDMF Directors and Member. With tremendous support from partnering schools of RAAS, we had 1,013 participants to sing on that day. A student of Lai King Catholic Secondary School acted as Santa Claus who brought us candy and gifts, had concluded this meaningful event with joy and fun. We thank you so much to those who have given us your financial backup and / or physical presence to support the disadvantaged youth in our community. The Opening Ceremony of Carol Singing 2013 organised by Child Development Matching Fund (CDMF) was successfully held on 8 December 2013 at 1881 Heritage. Chief Secretary Mrs. Carrie Lam and Secretary for Labour & Welfare Mr. Matthew Cheung were Officiating Guests. Chairman of CDMF PDG Moses Cheng welcomed all participants and delivered the Welcoming Speech. Mrs. Carrie Lam and PDG Moses presented an Award “頌唱陣容鼎盛大獎” to recognise Rotary District 3450 as we organised and committed most participants to support CDMF for 3 consecutive years. We mobilized 1,000 participants to support Carol Singing each year since we had been invited to join this event. PDG Tony Wong and PP Michael Kwan, who is the Fund-raising Committee Chair, represented our District to receive this Award as DG Eugene was attending the 2013 Taipei Rotary Institute. Non-stop Rotary Performance 扶輪唱不停大匯演 to support the Carol Singing Festival 2013 (聖誕頌歌節 2013) is scheduled on Sunday, 15th December, 2013 from 11 a.m. to 6 p.m. at the Shopping Mall of East Point City (東港城), Tseung Kwan O Town Centre. Let us sing for the disadvantaged youth! See you and your members of Rotary family there! This second program of the scheme – Workshop on Legal System in Hong Kong was held on 7 December 2013 at Sheung Shui Junior Police Call Clubhouse as one of the Anti-Drug Operations collaborated with Junior Police Call. Five legal professionals including barristers and solicitors shared their expert legal knowledge with participating students from 4 schools, namely, 迦密聖道中學, 香港道教聯合會圓玄學院第二 中學, 粉嶺禮賢會中學, 聖芳濟各書院. The formal certificate was sent to us for record as a new Guinness World Record of “The Longest Handshake Chain” was created by 3,434 participants at 3:23 p.m. on 2nd November, 2013 at Tseung Kwan O Sports Ground, Hong Kong. Non-stop Rotary Performance 扶輪唱不停大匯演 to support the Carol Singing Festival 2013 (聖誕頌歌節 2013), on Sunday, 15th December, 2013 from 12 noon to 6 p.m. at the Shopping Mall of East Point City (東港城), Tseung Kwan O Town Centre, Kowloon, Hong Kong. this meaningful event by mobilizing your members of Rotary family to join us singing for the disadvantaged youth in our community. The reasons of bad weather and technical issues in the past few months delayed the Helicopter Flights. Eventually, both Flights were executed on 23rd November, 2013 at the Hong Kong Aviation Club. Past President Lily Fenn of the Rotary Club of Happy Valley had kindly been the pilot and generously offered 4seats forstudents who achieved “The Best Improvement Awards”and4seats for the Top 4 ofRAAS Website Design Competition to enjoy a scenic Helicopter Flight over Hong Kong in her helicopter last Saturday. Enclosed please refer to the thank you letter and the sharing of flying experience from winners. All Club Presidents had been received the updated information recently. Our PDG Moses Cheng Mo-chi is also the currently Chairman of the Education Commission and the Chairman of Child Development Matching Fund (CDMF) which supports the long term development of our children coming from a disadvantaged background and helps them come out of poverty. Since our district has the same mission, we have been supporting CDMF by participating Carol Singing Festival for the last 2 years by enrolling over 1,000 singers to perform each time and helped fund-raising over HK$200,000.00 for CDMF. It will be the third time for us to organize this meaningful event and certainly, it will never be a success without your support. We truly anticipate that you will either sponsor our singers to sing or organize your own choir to support. Of course, both actions will highly be appreciated with deepest thankfulness. Non-stop Rotary Performance 扶輪唱不停大匯演 to support the Carol Singing Festival 2013(聖誕頌歌節 2013), on Sunday, 15th December, 2013 at the Shopping Mall of East Point City (東港城), Tseung Kwan O Town Centre, Kowloon, Hong Kong. Registration Form is enclosed for your necessary action. Thank you very much for your tremendous support! Both District leaders thanked the OC members for their hard work and presented the Certificate of Appreciation to Principal Eric Yuon of Buddhist Fat Ho Memorial College for Hosting School and as a token of Appreciation for the Stage Performances provided by their students while to Mr Wong Chun Chee, Ms Karan Tang and Mr Abby Shek of Hong Kong Institute of Vocational Education (Haking Wong) for they recruited a total of 477 students as volunteer helpers in this event. Item Sponsorship had been sponsored by DG Eugene Fong, PDG Tony Wong and Ho Wai Printing Company Limited, 2 Rotarians of Rotary Club of Happy Valley, namely, PP Winnie Yuen and Rotarian Chiu Yu Kan. In addition, sponsorships were solicited from Regal Hotel via DGE Belinda Yeung and Holiday Inn Golden Mile through PDG David Harilela. Thank you very much for all of your tremendous supports and collaborative efforts. Consequently a new Guinness World Record of “The Longest Handshake Chain” was created by 3,434 participants at 3:23 p.m. of 2nd November, 2013 at Tseung Kwan O Sports Ground, Hong Kong! Please receive the information from RAAS Chair PDG Tony as below. To show our care to child development and poverty alleviation for our community, DG Eugene participated the formation of Child Development Initiative Alliance (CDIA) and is encouraging our district to aid Child Development Matching Fund (CDMF) by organizing a Non-stop Rotary Performance 扶輪唱不停大匯演 to support the Carol Singing Festival 2013(聖誕頌歌節 2013), the once in a year’s fund-raising campaign for CDMF which will be held on Sunday, 15th December, 2013 at the Shopping Mall of East Point City (東港城), Tseung Kwan O Town Centre, (adjacent to MTR Hang Hau Station) Tseung Kwan O, Kowloon, Hong Kong. F. Deadline of registration: On or before 5th December, 2013. For registration, please complete the attached registration form and send it back to the attention of PP Wendy Mung at wmung@hkstar.com by return email. It will be scheduled on 15 December, 2013 (Sunday) from 12 noon to 6 p.m. at East Point City 東港城 at Tseung Kwan O in order to support Child Development Matching Fund (“CDMF”). The Child Development Fund is a poverty relief policy introduced by the Hong Kong Government following a recommendation of the former Commission on Poverty in 2008. – Provide personal development opportunities for youths coming from disadvantaged families. help them fight poverty effectively and to cultivate a positive outlook in life. – The Festival requires every Singing member to contribute HK$200 to sing. The HK$200 represents the monthly personal savings of one child coming from a deprived family. – Each choir member was encouraged to donate HK$200 or donation is to be made by their partnering Rotary clubs or by other CDMF supporters. To enroll 1,000 Singers from our Rotary Family including Rotarians, Rotaractors, Interactors, Rotary Adopt A School students, Rotary supporters to sing from 12 noon to 6 p.m. on 15 December, 2013 (Sunday) at East Point City. Sports Day for All Co-Chair PDG Tony Wong truly thanked all of you for the great support to this event. Mrs. Carrie Lam was our Officiating Guest. DG Eugene Fong, DGE Belinda Yeung and spouse, PDG and Mrs John Wan, CDS Eric Chin, AG Heman Lam, DS Gary Yeung and many District Officers graced our occasion. PDG Peter Wan attended as the VIP of Hong Kong Blind Sports Federation. “I was overwhelmed with excitement by the announcement from Ms Lisa HOFFMAN, Guinness World Records Adjudicator that a new Guinness World Record (GWR) of “The Longest Handshake Chain” was created by 3,434 participants in the afternoon of 2nd November, 2013 at Tseung Kwan O Sports Ground, Hong Kong. I take this opportunity to thank all of those who offered their care for visually impaired people, efforts to help, patience to follow and tolerance to adopt sudden changes due to unforeseen difficult situations. “Sports Day for All” received over 4,700 registrations from very enthusiastic schools, NGOs and Rotary family members of our district in advance. Originally, we must thank to our over 1,200 volunteer helpers who agreed to surrender their registration for GWR to others since the highest allowance of participant for Tseung Kwan O Sport Ground is only 3,510 people. Unfortunately, we were informed at around 12:40pm that Observatory would consider hoisting Typhoon Signal #3 at about 2:00pm. Since Education Bureau is one of our event hosts, advised us that according to the rules, we must need to prepare for discharging our students once Typhoon Signal #3 was hoisted and the GWR should not be recognized if it was operated under illegal situation. We estimated that we were still waiting for over 1,000 participants to arrive then. After discussion with Lisa, the GWR Adjudicator, she agreed to accept the attempt to be done by all who were there by a simple signing of names for registration. was made at 3:23 p.m. We were lucky that the Typhoon Signal had not raised higher, and officially registered participants were over 3,000. 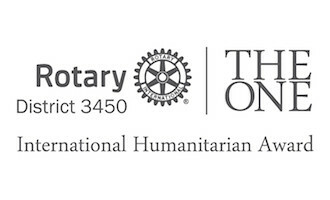 In addition to RAAS Committee, there were 23 Rotary Clubs, 15 RAAS schools, 6 Interact Clubs, District Rotaract Committee and 8 Rotaract Clubs totally over 1,400 people participated from Rotary Family. The attending list is shown as below. 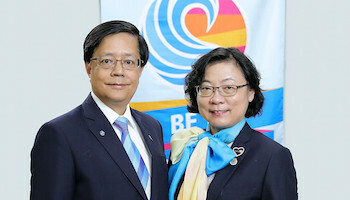 DG Eugene Fong and Hon. Kenneth Leung Kai-cheong were Guests of Honour. Two files were sent out to participants for them to read carefully prior to the event day. Thank you very much for your support and see you there!